Cultured pearl jewellery is typically strung on a silk thread with a knot between each pearl to prevent wear caused by the pearls rubbing against each other. It also protects against the loss of pearls in the event that the thread should break. Of course, this silk thread will undergo some natural wear and tear, particularly if you wear your pearl jewellery frequently. The silk thread may stretch and weaken over time, so if you see extra space between the knots and pearls, it may be time to have your jewellery restrung. 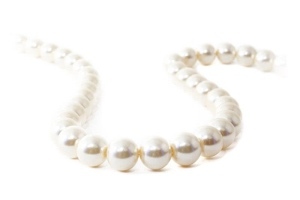 At European Goldsmith, we are happy to assist you in the restringing of your pearls. This is not an on-site service we provide however, we will arrange to have them professionally restrung for you and ensure that they will be in good hands. We understand that your jewellery holds incredible sentimental value and quality workmanship is important.